Did you know that the Connecticut Department Of Transportation considered putting a beltway similar to I-291 through the middle of Vernon, including the Tankerhoosen Valley? In the 1960's the DOT explored building beltways that would take traffic around Hartford. They looked at an inner beltway and an outer beltway. In 1961 they proposed an outer beltway layout, designated Route 140, that began at Bolton Notch, ran along Railroad Brook through Valley Falls Park, then cut through the heart of Vernon to the five corners in Ellington and on to a new bridge above Windsor center. Fortunately this design didn't get off the drawing board, but it must have caused much concern in Vernon at the time. Does anybody remember it? The 1960's was a time of expansion. The Interstate system was introduced by Eisenhauer in the 1950's and building and planning continued for the next several decades. The Grand Plan East of the River was for the Wilbur Cross Parkway from East Hartford to Sturbridge to be expanded as I-86 with a second highway, I-84, to go through Bolton Notch, Willimantic and on to Providence. A ring highway would circle Hartford through Glastonbury, Manchester and South Windsor to the Bissell Bridge with an outer ring connecting Vernon to I-91 over a new bridge above Windsor. There were several concepts for the outer ring. One ran from I-84 at Bolton Notch through Vernon and East Windsor to a new bridge about Windsor. The route shown is approximate but the section through Vernon would have probably followed the Railroad Brook from Bolton Notch through Valley Falls Park, through the Belding Wildlife Management Area to the Five Corners at Ellington and on through East Windsor. Imagine what an I-291 width road would have done to the town and the loss to the scenic Tankerhoosen Valley. Fortunately this never got off the drawing board. In 1963 Route 140 was extended to Stafford instead. A second concept, that would have affected Rockville only, would have extended Route 20 from Bradley Field over a new bridge cutting through East Windsor, Ellington and Rockville to I-86 at the current Exit 67. 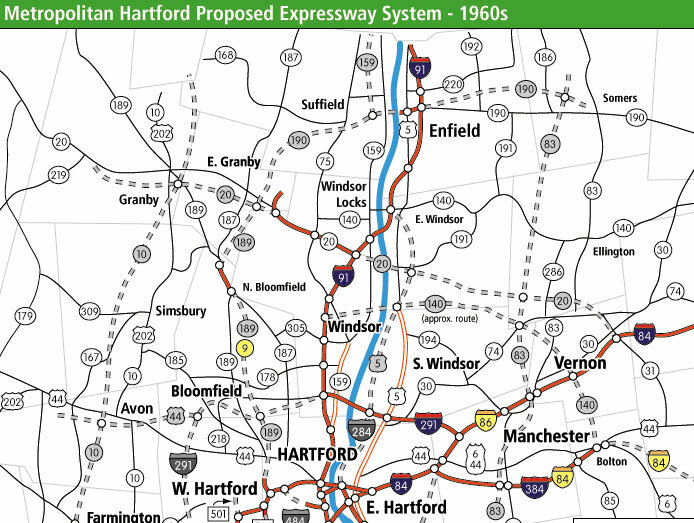 In 1968, the states of Connecticut and Rhode Island were granted an Interstate route between I-84 in East Hartford and I-95 in Providence in the "Proposed Interstate System Adjustment" report. The new route, which was to parallel US 6 and US 44 through Tolland and Wyndham counties, was to be designated as a re-routed I-84. The existing I-84 between East Hartford and Sturbridge - the "Wilbur Cross" section - received a new designation: I-86. But the Grand Plan faced a lot of local resistance. Rhode Island, after much study, opposed an Interstate to Providence which would have passed through the Scituate Reservoir, Providence's water supply. The remnants that were built include I-384 (opened in 1973) in Manchester and the Route 6 Willimantic Bypass. We are still fighting over a Route 6 expansion from Bolton Notch to Willimantic. In 1984 the highway through Vernon was renamed I-84. The Putnam Bridge connecting Wethersfield and Glastonbury was built for the Inner Ring Road, but East Hartford balked at having another Interstate dividing their town. Eventually the I-291 section through South Windsor and over the Bissell Bridge was constructed to connect with I-91. Fortunately for Vernon the Outer Ring Road never got past the early planning stages and was probably not seriously considered; but it must have put a scare into residents at the time. The time of great highway expansion has passed. Environmental regulations are much stronger today and money is much tighter. Now we have a few tweaks, bridge replacements and maintenance. But the next time you enjoy the beach at Valley Falls Park imagine what it would look like with an Interstate coming down the valley. The Internet is wonderful in that every hobbyist can share his passion with the world. One of these is Scott Oglesby's Connecticut Roads web site. This is the place for information on every numbered highway -- living, extinct, or proposed -- in Connecticut. He has history for all of them, and custom maps and more details for some. Other good resources are Connecticut: Highways to Nowhere and Interstate 84-Connecticut: Historic Overview.